A Marina Del Rey Wedding has the exquisite ambiance of a Mediterranean seaside villa, while being just six miles from Westchester, New York. This wedding venue is family owned and has been hosting events for over 30 years. It is a prime location that overlooks both the tranquil Long Island Sound and the dazzling Manhattan skyline. Marina Del Rey was opened in the early 1970s by Sal Randazzo and his mother. Since then, the venue has been the favorite location of many a bride and groom who choose to have a Marina Del Rey Wedding. The location offers three rooms that couples can choose from for the reception based on the number of guests the are anticipating -- the Venetian Room, the Bellagio Room, and the Carseval, with the Carseval fitting the largest amount at up to 800 people. The space also provides a separate bridal room for the couple where the bridal party can relax and enjoy food and cocktails as guests arrive to the reception. In the picture above, this bride and groom who chose to celebrate at the Marina Del Rey share their first dance as a married couple. Guests stand on the edges of the dance floor in quiet awe of the love they are witnessing in this moment and have been privy to throughout the entire day. The newlyweds glow at the center of the room, swaying to the melody of the song that plays. A small smile plays on the lips of the bride as her husband whispers in her ear. In this instant they are an image of pure romance. The angle I took this picture from gives the impression that the bride and groom are further away. It also makes the lighting fixture at the forefront of the image appear to be larger than life. 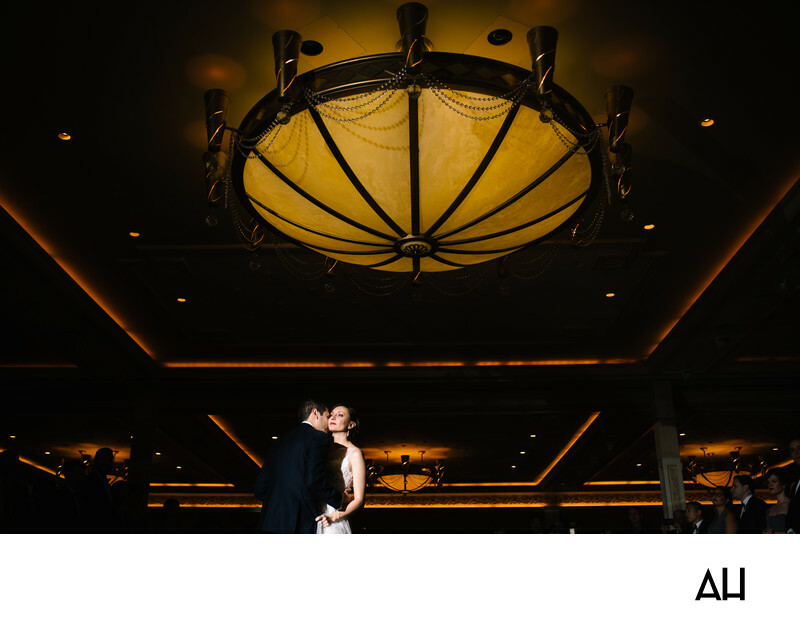 The light glows like the moon above the happy couple, illuminating this magical moment. Smaller lights run across sections of the ceiling adding to the intimate feeling of the dance. Soon, the guests will join the couple on the dance floor, but for now, the song is just for them.